If you are looking for Screwdriver Set Pack of 32, then you search ends here as you can shop online for Jackly 31in1 Ratchet Screwdriver Set (Pack of 31) at Rs 89 from Flipkart at an affordable price. Meet the Jackly 31-in-1 ratchet screwdriver set - the tool that every household should have. With this compact screwdriver set, you can complete all the pending repair works by opening mobile phones, computers, PDA housings, PSPs, NDS, and music players. This screwdriver set comes in a plastic storage box, with approximately 5.5 cm diameter and 12 cm height, which is compact and stores all the parts. It has a handle length of 10.2 cm and blade length of 2.8 cm. The Jackly 31-in-1 multi-functional pocket screwdriver set comes with magnetic bits that are easy and tight to absorb into the handle. The handle also comes with a rubber wrap and has a swivel thumb rest which offer a comfortable grip. This piece comes with 30 screwdriver bits, which include 9 torx heads, 4 Phillips heads, 7 straight heads, 8 hex heads and 2 Phillip heads, and one plastic grip handle which is ideal for changing out any faceplates. 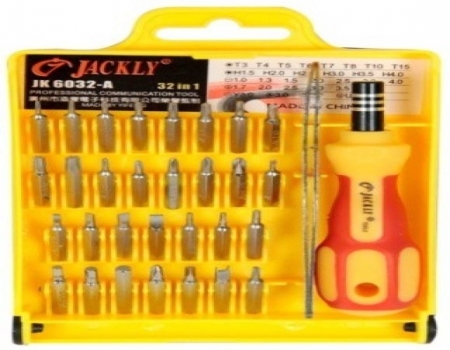 Add Jackly 31in1 Ratchet Screwdriver Set to your cart. Make Payment of Rs 89 only.